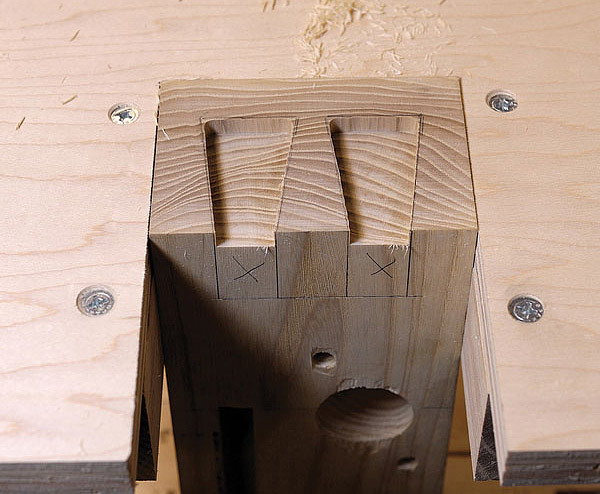 I know what you’re thinking: “Another opinion on how to cut dovetails.” I hear you. But this one’s different. I promise. No back and forth over pins or tails first. No Rob Cosman vs. Frank Klausz. Well, actually a little Klausz. 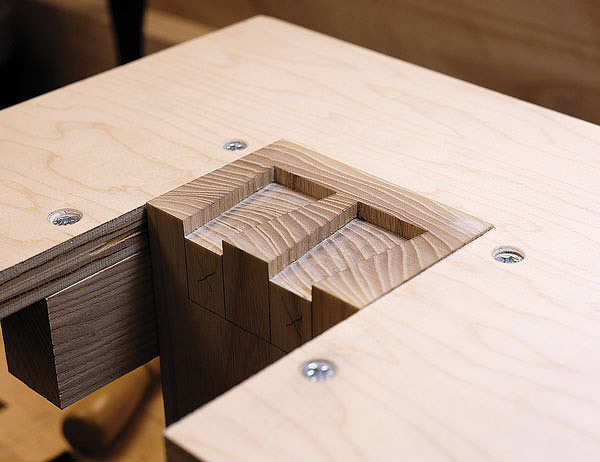 When I built my first serious workbench in the 1990s I practically memorized Scott Landis’ “The Workbench Book” (Taunton) and like many woodworkers I was attracted to Frank Klausz’s beautiful bench, especially the large, crisp dovetails that joined the parts of the tail vise. Klausz told us what tools he used to cut the joints, but didn’t elaborate much on technique. I suppose with a lifetime of skill at your command, you just pick up the tools and the joint emerges. I wanted the crisp look of Klausz’s joints without waiting 20 years to develop the skill. After building several large benches over the past few years, this technique emerged. I’m a big believer in making dovetail joints that fit right off the saw. That’s a skill that’s easy to learn with some practice. But not so with the beefy members of a workbench, or large-scale furniture. 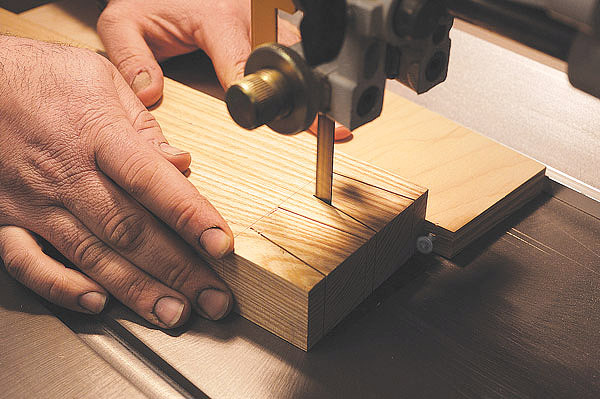 When you need to cut tails on the ends of an 8′ board, how do you hold the workpiece? I’ve seen people stand on top of their bench, climb ladders, even clamp the board to a second-story deck railing just to get the thing vertical so they can use a backsaw to cut the joint. Instead of that drudgery I lay the piece flat, and use the band saw and router to cut this joint, utilizing the strengths of those machines. I also use hand tools where they excel. 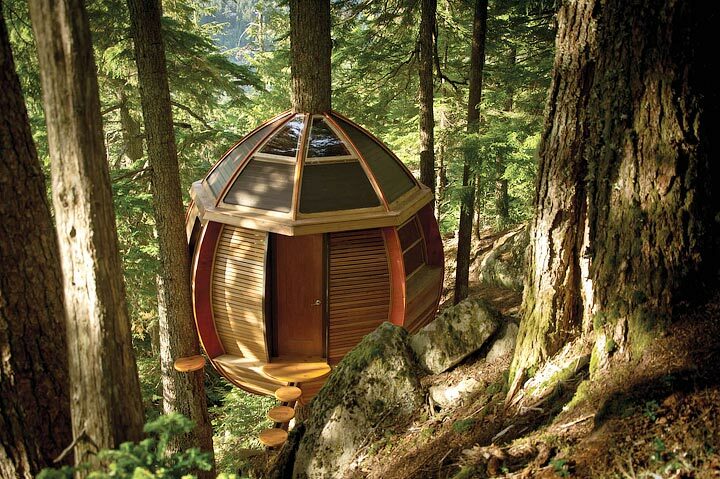 This is truly blended woodworking. 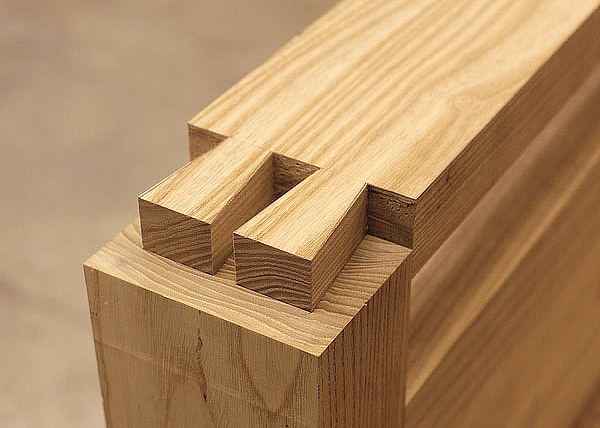 This technique uses the same sequence of layout and cutting as if you were making the joint by hand, and all the critical fitting is done by hand, using accurately scribed lines. The machines provide some precision, but none of the fit is dependent on super-precise machine setups. 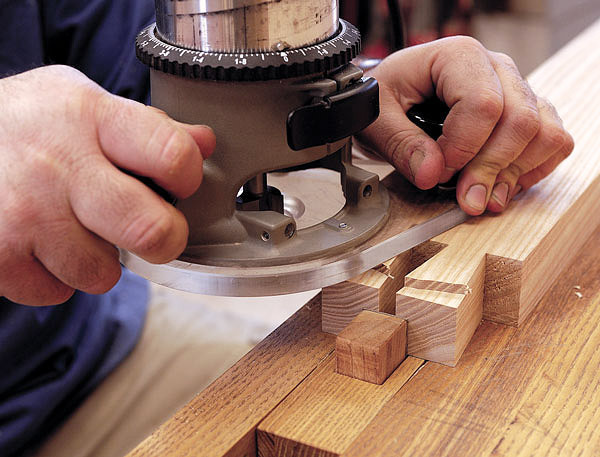 This technique works equally well with half-lap or through-dovetails. To get started, lay out the tails in the typical fashion. I’m cutting a half-lap (also called half-blind) joint for a workbench’s front laminate (the tail board) where it joins the end cap. Both boards are 4″ wide, with the tail board 1-1⁄2″ thick. Because this is a half-lap dovetail I set the marking gauge to leave about 5⁄8″ of material on the pin board past the tails. 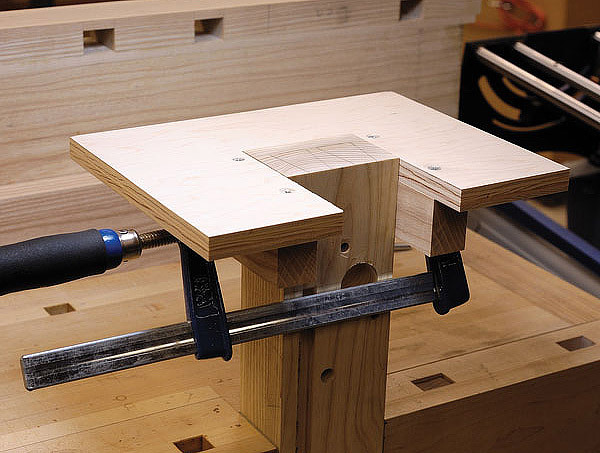 This isn’t a critical dimension, so I go for looks – beefy for a workbench. Scribe all the way around the board. 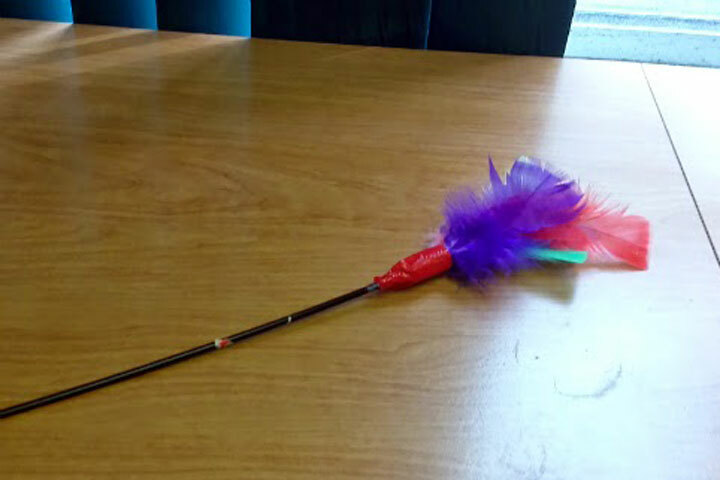 After scribing, use a bevel gauge and pencil to lay out the two tails. Set the gauge to about 7°. Here’s an important point: When laying out the tails, make the width of the tail’s base about 3⁄16″ wider than your router bit. Later, you’ll be routing away the tail sockets in the pin board with this bit, so it needs to easily fit between the pins. My pins’ base is about 3⁄4″ wide. Size your tails so the base is wider than the router bit’s diameter. The tails are cut on the band saw using a foolishly simple angled spacer that takes about three minutes to make. Cut a piece of wood (I used a plywood offcut) to about 16″ long and 5″ wide. The dimensions aren’t critical. 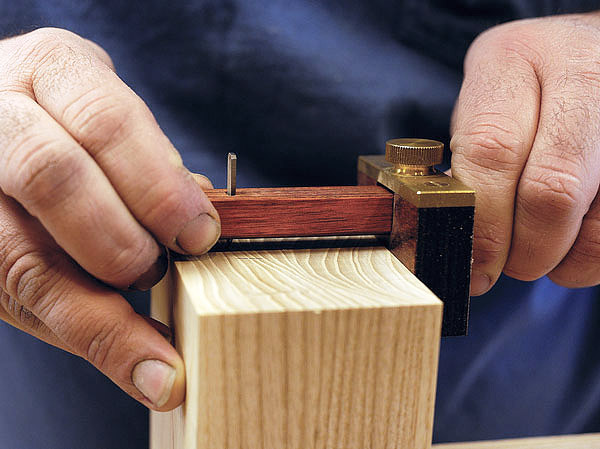 Now take your bevel gauge and draw a line along one long edge of the spacer. I use a long steel ruler to “extend” the blade on the bevel gauge. Cut to this line on the band saw. If you’ve cut straight and true, you don’t even need to bother cleaning up the edge. Slide both the spacer and workpiece along the fence to make the cut. Flipping the board cuts the opposite tail perfectly without measuring. Next, drive a screw near the end of the tapered edge and let it protrude about 3⁄8″ or so. This will be the stop for the tail board. To set up the cut, keep the tail board pressed tight to the screw and the edge of the spacer, then approach the blade to set the fence. (Make sure the screw stop isn’t in the path of the blade.) Adjust the fence so the blade is on the waste side of the line. You don’t have to be too fussy here. 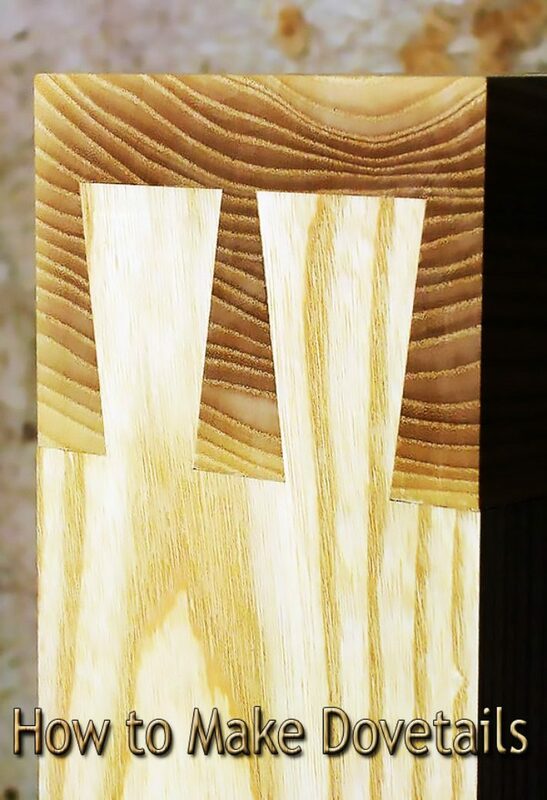 Just like for a hand-cut dovetails, we’re going to use the tails as a pattern for cutting the pins. You will want to set up a roller stand to support long workpieces. To make the cut, slide the spacer and workpiece along the fence. Stop just short of the baseline. 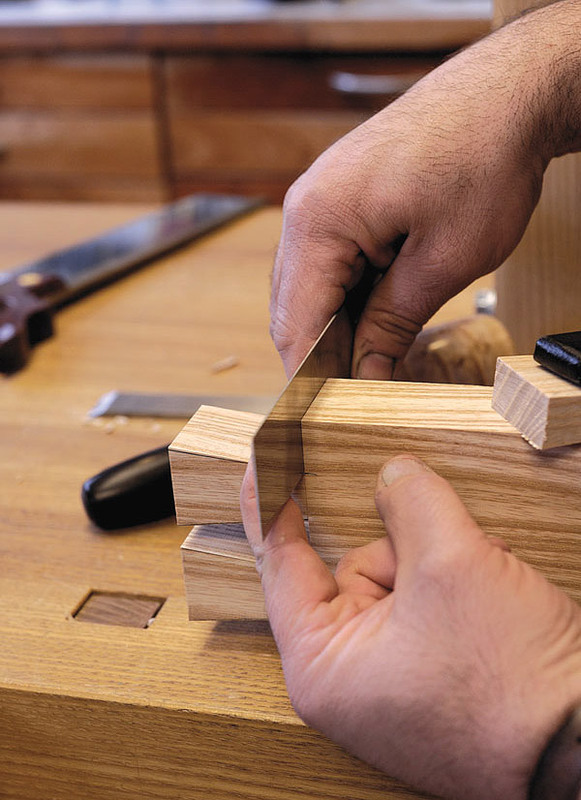 To cut the outside edge of the other tail, simply flip the board over and repeat. Don’t worry about nailing your layout line, this will automatically size and center the tails on the board. And also don’t fret if your angle is off a tad (you can see in the pictures that mine is). It doesn’t matter one bit. 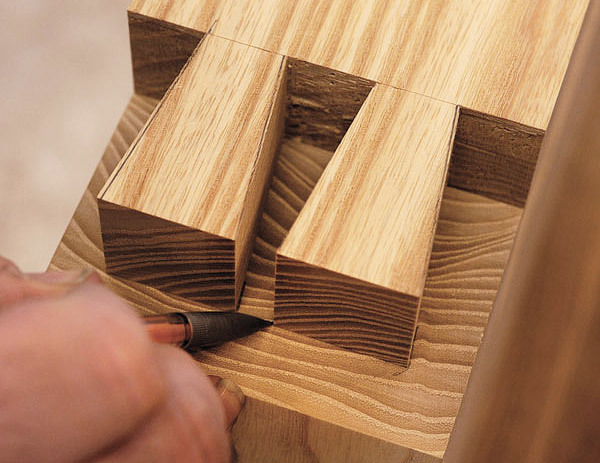 Chiseling the end grain allows controlled precision. 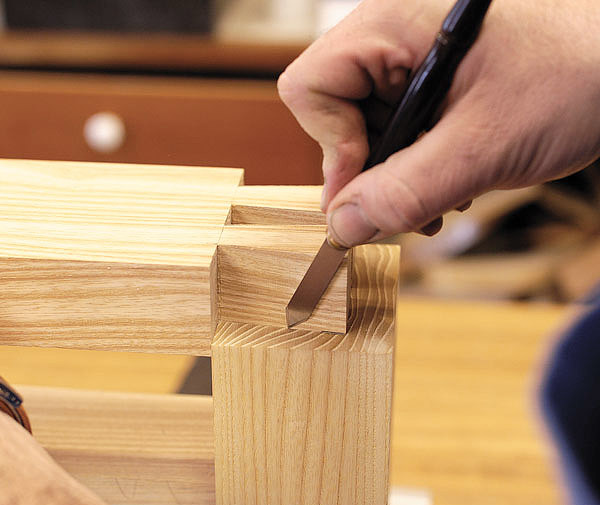 Use a wide chisel to test for flatness. To cut the opposing angle on the tails, remove the screw stop, flip the spacer end for end, and replace the screw in the opposite end. Cut the remaining edges, flipping the board as before. Next, I remove the spacer and use the band saw to nibble away some of the waste from between the tails. A 17 percent rebate. Cut away about 1⁄4″ to form the rabbet. Next, move to the bench and use a backsaw to remove the waste from the half-pin area. Here you want to maintain an absolutely crisp arris, so don’t saw right to the scribe line. Stay away from it just a little. To chisel the end grain precisely I drop the edge of the chisel into the scribe line and tap firmly once. This pops out a small amount of material. Do this on both faces of the board (look close, you can see those areas I’ve removed). 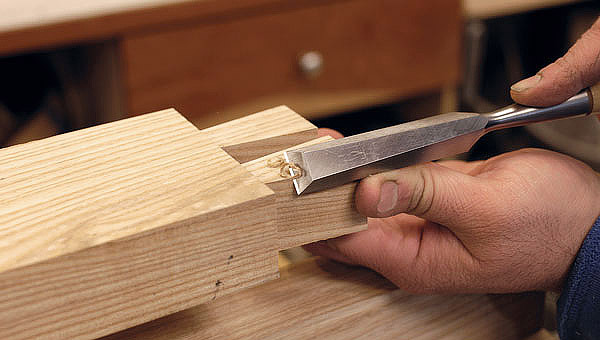 Then I flip up the workpiece onto its edge and chisel away the shoulder with a series of cuts, using a 1⁄2″ chisel. I find that if I try to cut the entire shoulder with the workpiece on edge, using a chisel that’s wider than the thickness of the board, I will almost always cut past the scribe line on the faces of the board as the chisel reaches the inside bottom of the shoulder. Cutting away a little ledge on the faces first allows me to establish that crisp arris, thus I can stay away from it as I chisel the center portion of the shoulder, with the workpiece on edge. This also allows me to focus my attention on keeping one scribe line crisp as I chisel, instead of all three. Using a relatively narrow chisel also allows more control and precision. I don’t chop aggressively, rather I make several lighter taps to maintain control of the chisel. To make sure I don’t have a hump in the middle of the shoulder I check it with the back of a wide chisel. I rock it back and forth. It should click down positively on each arris as you do this. Chisel out the waste between the pins the same way, getting 95 percent of the waste out of the way before you take your final pass with your chisel registered in the scribe line. I use a router to cut a rabbet on the back side of the tails. 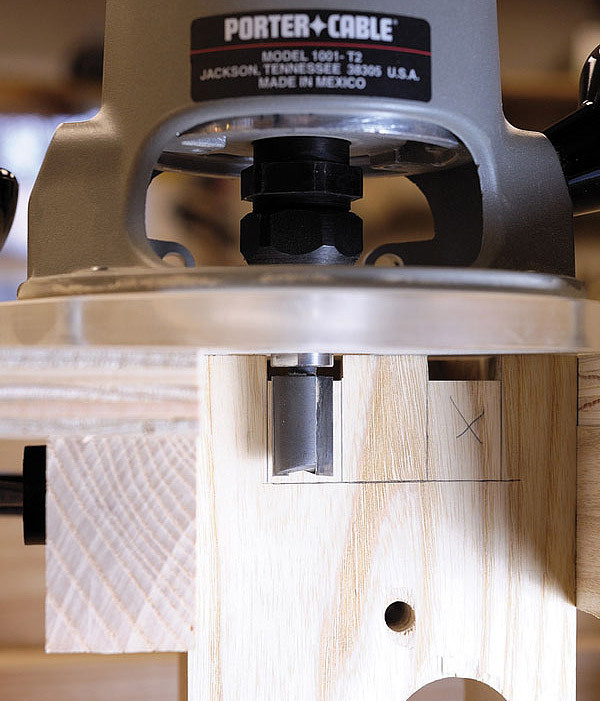 This aids in laying out the pins, and it also relates to the cutting length of the router bit. More on this later. I stay away from the baseline with the router, then clean up the baseline with a chisel. Mark the pencil lines tight to the sides of the tails. Scribe lightly. You don’t want to make a grand canyon here. Begin laying out the pins by smoothing the end grain of the pin board. I use a sharp block plane set for a light cut to remove the saw marks, then block sand a little with #220 grit so I can make clean, crisp pencil lines. Make sure you keep the end flat and square. Next, place the tail board onto the end of the pin board, butting the shoulder of the rabbet on the back side tight to the inside face of the pin board. Using a 0.5mm mechanical pencil, place the lead tight to the edge of the pins and draw a single line about 1⁄2″ long, alongside each of the four edges of the tails. Make sure you’ve marked right up to the edge of the tails. Don’t let the body of the pencil push the lead away from the edge. Just like when I hand cut a dovetail, I scribe the position of the tails onto the end grain of the pin board with a marking knife. But unlike when making a hand-cut joint, I don’t have the ability here to slightly shift the position of my backsaw to compensate for the thickness of the scribe line. Just as when chiseling the shoulder of the tail board, I want to be able to drop my chisel right into a scribe line to crisply establish the location of the pins. If I scribe with the tail board in one fixed position, I’ll actually be marking outside the boundaries of the tail’s socket, thus the socket will end up too large. 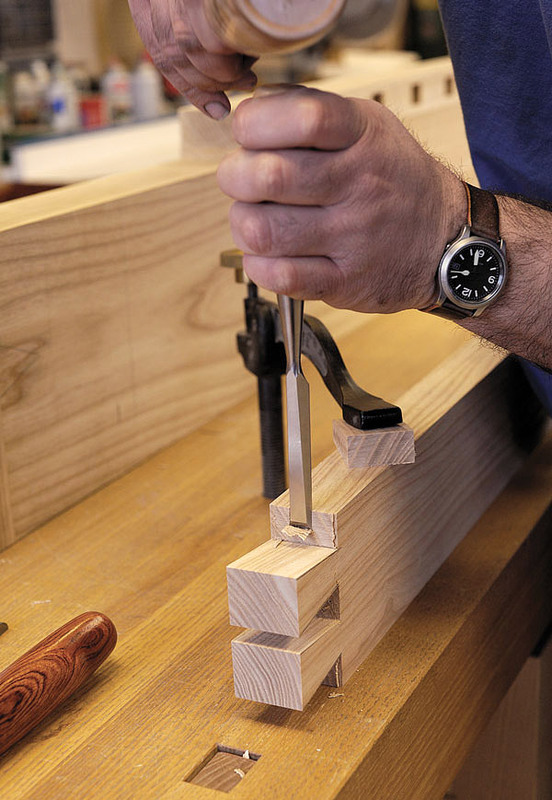 Use a marking gauge to establish the length of the tails on the pin board. So I’ll need to shift the tail board left and right in order to get my scribe line exactly where I want it. The 0.5mm pencil lines provide a way to observe minute movements of the tail board, which greatly helps in positioning the tail board for scribing. The measurement of 0.5mm is about 20 thousandths of an inch. I find that my marking knife, when used with light pressure, leaves a line about 10-thousandths wide. So in order to get that scribe line on the inside of the tail’s socket, I’ll need to shift the tail board over by about half the pencil line. This is where the pencil line is quite precise. You can tap the tail board over in small increments and watch as the tails begin to cover the pencil lines. You can adjust the offset by just a few thousandths with each tap, and more important, observe how much you’re moving. For hardwoods such as this ash, I’ll move the tail board over so it covers about half the pencil line. 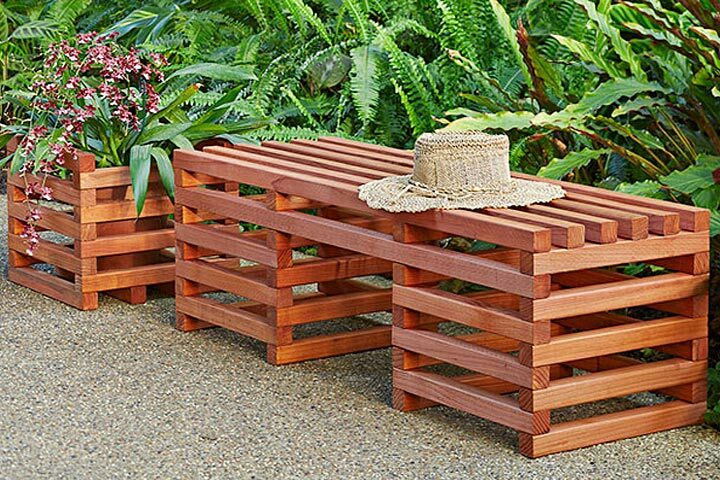 For softer woods, or for joining a hardwood tail board to a softwood pin board, you can move farther. The more pencil line you cover, the tighter the joint will be. To scribe the tails onto the pin board, shift the tails to the right and observe the movement by watching how much of the pencil line gets covered by the tails. Now scribe just the left sides of each tail. Now shift the tails to the left, using the same offset as before, and scribe the right sides of each tail. You’ve now placed the scribe lines precisely in the same plane as the sides of the tails, plus or minus a few thousandths. 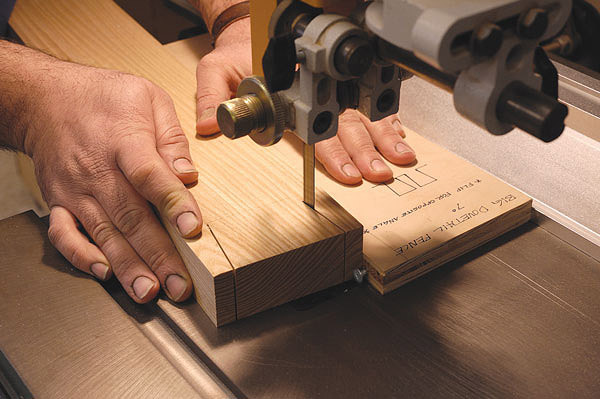 Now use a marking gauge to define the length of the tails on the pin board. Close up the fence slightly (a few thousandths) so you end up with a nice tight fit here. A quick support platform helps to keep the router from tipping. 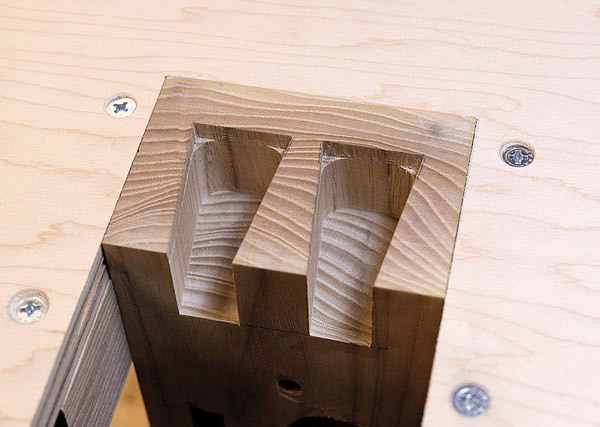 A trim router with a 1⁄4″ upcut spiral bit gets rid of most the initial waste. 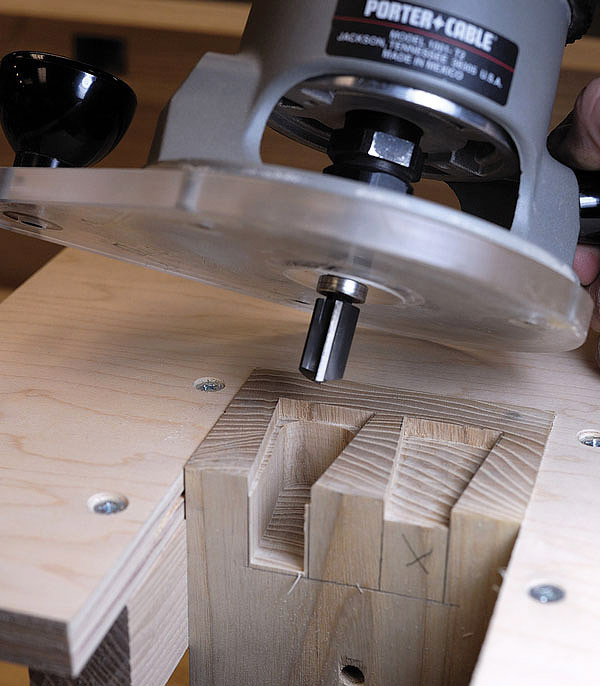 Get close with the router and the chiseling will be easier. Now that the position of the pins is established, the waste can be routed out. I usually just rest my router on the end of the pin board, but it’s a good idea to make a platform around the pin board to help support the router. I position the top of the platform to be just a hair under the pin board surface. The platform is just there for security; you want the router to register off the top surface of the pin board. 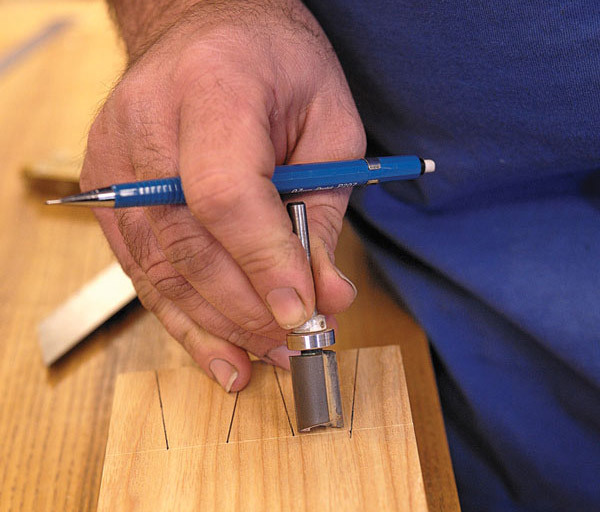 Use a marking gauge to define the rest of the tail sockets on the pin board. 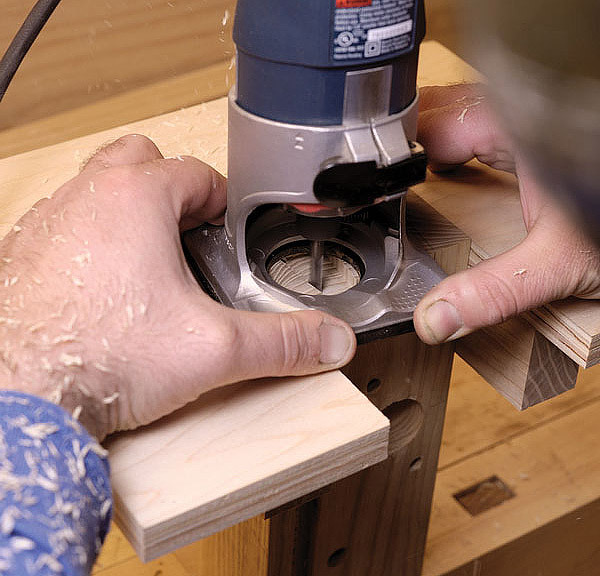 Use a router to remove about 1⁄4″ depth of material from the waste areas. Stay about 1⁄32″ away from the scribe lines. This is where this technique really shines. Unless your pin board is cut from dead-perfect straight-grained stock, you’d never be able to pare down into this joint without splintering. After cutting the side that’s with the grain, you might consider opening your own woodworking school. With the other side you’d be chucking the pin board through a picture window! And if you cut across the grain from the inside of the pin board, it would be difficult to keep a flat surface without lots of guide blocks and fussy setting. By paring out the last sliver of waste, only 1⁄4″ deep, you basically eliminate any grain direction issues. You also establish a nice exact pattern for the rest of the socket. Paring down establishes the final shape of the tail sockets. Clean work yields precise results. 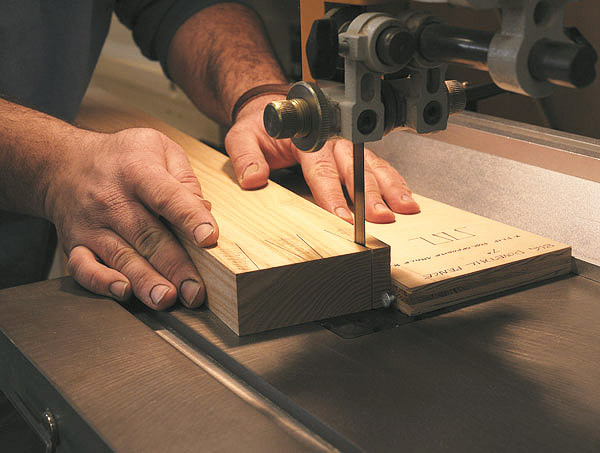 To pare out the waste, drop your chisel right into the scribed line all around and tap down. If you routed close, you don’t even need a mallet. Be diligent here. This is the make-or-break moment. If you chop outside your scribe line, it will be glaringly obvious. Also, work carefully around the pin board now – those sharp arrises are easily damaged. Here’s the neat part. The pattern you just established will mean easy cutting of the rest of the socket using a top-bearing pattern bit. This is why we kept the base of the tails wider than the width of the router bit. The bit I’m using has a 5⁄8″ cutting diameter and a 1″ cutting length. You can easily get pattern bits in various configurations that work with this technique. Set the router to mill the socket to full depth. Get rid of most the waste on your first pass. Let the bearing rub the pattern for the final cut. Because the bit is cutting parallel to the long grain, the router works easily, making long, straw-like chips. You can take a full-depth pass, although you do have to be aware of your feed rate. Take it slow so the bit doesn’t get out of control. You might want to practice on some scrap. I like to waste the bulk of the material first, staying away from the “pattern” at the top of the socket. Once the majority of the waste is removed, I let the guide bearing lightly follow the pattern, just letting it kiss the chiseled surface. Do not be tempted to press the bearing hard to the pattern – you could dent it and ruin the fit of the joint. The router is removing very little material, so it’s easy work, and you can use a light touch. 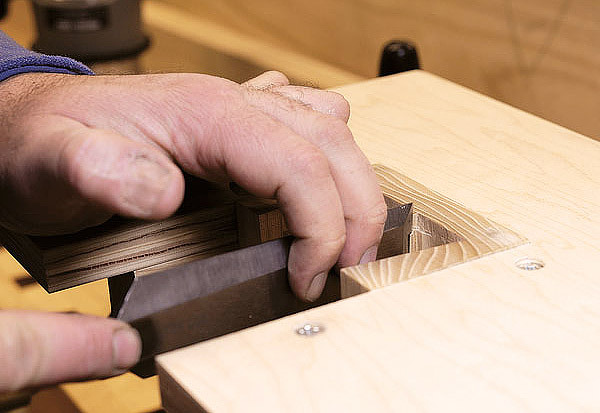 You don’t need a corner chisel to chisel the corners. Everything is crisp, flat and where it’s supposed to be. Ease the back corners of the tails so they don’t bruise the pins. You’ll know immediately if you’ve nailed it. Use a chisel to clean the waste from the rounded areas in the corners where the bit couldn’t reach. These are easy areas to work because they are below the surface; you don’t have to fuss with making them perfect. Be careful to not split out the pin board. The platform here helps to prevent this. 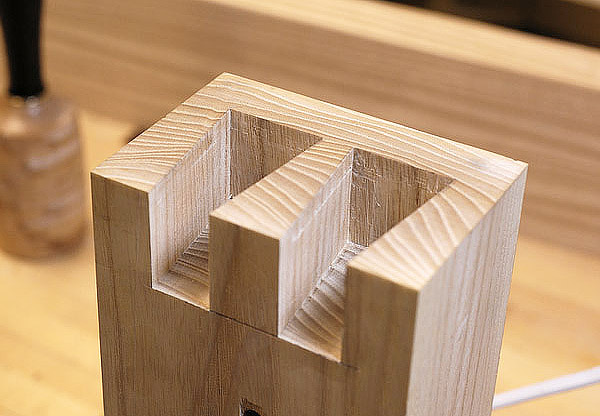 The rest of the world’s dovetails will be jealous when you plane the finished joint. To help ease the joint together, cut a chamfer on the back corners of the tails. I once cut the chamfer on the fronts of the tails. Once. 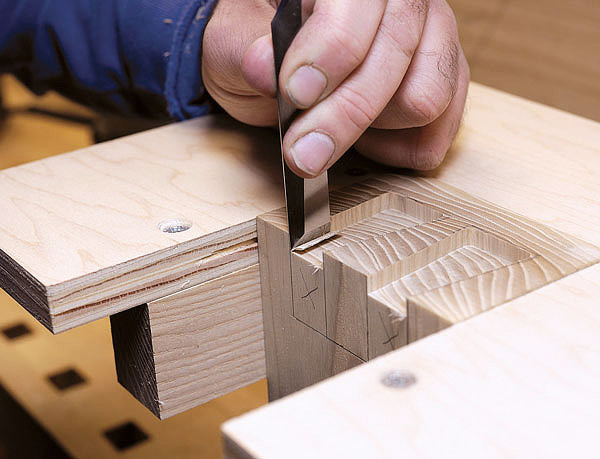 If you’ve done everything carefully, the joint will slide together sweetly, requiring just a few taps with a hammer. Don’t fully seat the joint. If it’s going in well at the beginning, the rest should be fine. The final satisfaction comes after the glue dries. 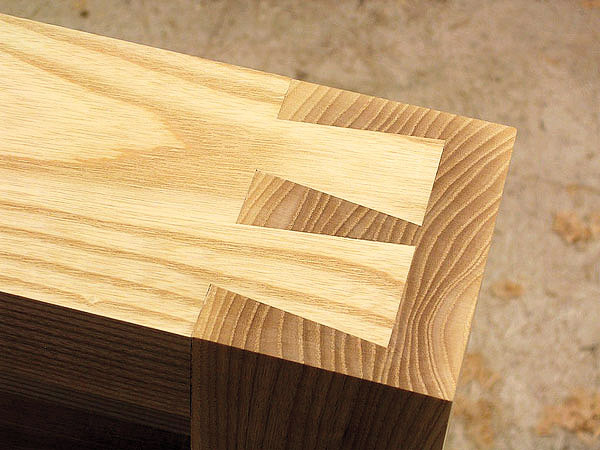 Use a sharp handplane to reveal the crisp details. Well done! It is going to be difficult to replicate this work; but I will try.